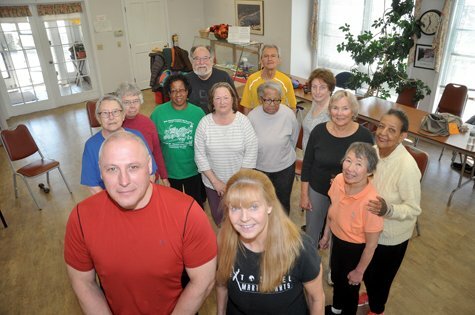 I was asked to write a piece about a group exercise class held at the Tisbury Senior Center. As I walked in I expected to hear a trainer bellowing orders, but instead I heard an abundance of laughter. I followed the happy sounds and found 15 seniors sitting in chairs in a circle doing leg lifts. They proceeded to stand behind their chairs and do lateral lunges, bicep curls with weights, and even one minute planks! I was honestly impressed. One attendee, Gloria, who had just turned 90 was doing curtsy squats like a pro. The co-trainers Catie and Erik Blake, a husband and wife team who own Blitz Fitness in West Tisbury, were having just as much fun as the students; one could see and hear the passion–and compassion–they had for this special group; making sure everyone's form was just right, and quickly knowing exercise modifications if someone was having a hard time. Catie & Erik would challenge their trainees, and in response the pupils pushed themselves a little harder. After the class I had the opportunity to speak to some of the attendees, a common theme during my conversations was how agile they had become since starting the class. Simple tasks they once found hard, like picking up things on the floor or putting items away on a high shelf, they could now do with ease. This well-being, and the fact they have formed close friendships with their fellow students, keeps them returning twice a week, with actual feelings of disappointment if they have to miss a class. Two important things Catie and Erik teach–and demonstrated–is how to get up independently if they were to ever fall–though each one remarked their increase in stability was astonishing–and how to stand up from a chair with ease. This twice weekly, one hour class is graciously funded by the Tisbury Board of Health. Started in October of last year, the class has grown from one student to 15 in that short time, and often swells to 20 or more. It was heartwarming to see these people push age aside through strength training and physical activity ensuring their quality of life was of the utmost.